"The Holocene records show consistently warmer than present-day Sea Surface Temperatures except for [~ 600 years during the Little Ice Age]." 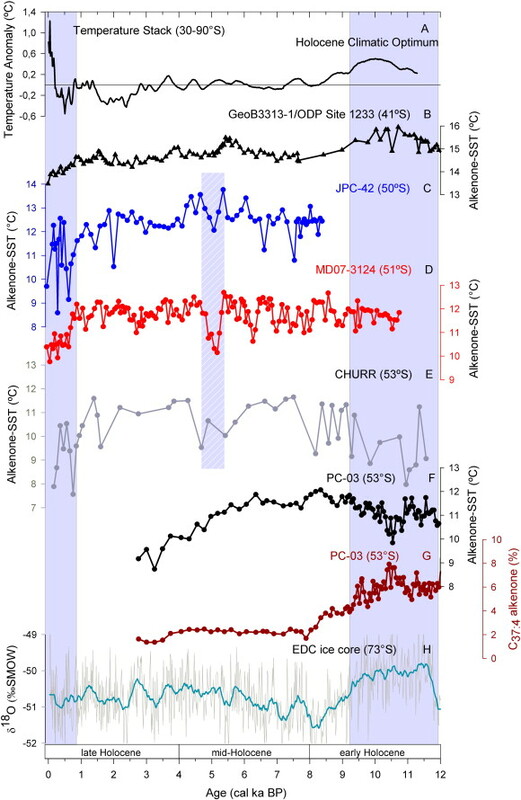 The paper joins hundreds of published non-hockey-stick temperature reconstructions worldwide demonstrating the Medieval, Roman, Egyptian, and Minoan Warm Periods, and Holocene Climate Optimum were all naturally warmer than present-day temperatures. LIA = Little Ice Age, MCA = Medieval Warm Period. Note top graph appears to be based upon one of Mann's bogus temperature reconstructions. Remaining graphs show SST reconstructions along southern coast of Chile. Here we provide three new Holocene (11–0 cal ka BP) alkenone-derived sea surface temperature (SST) records from the southernmost Chilean fjord region (50–53°S). 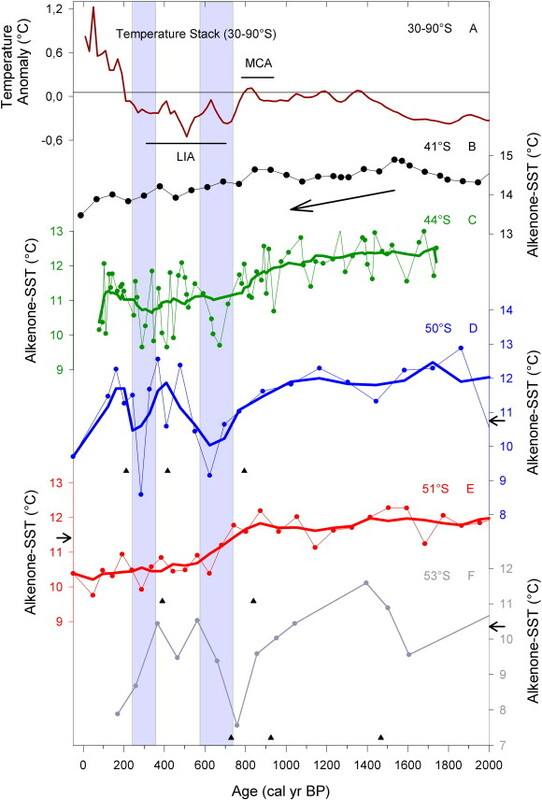 SST estimates may be biased towards summer temperature in this region, as revealed by a large set of surface sediments. The Holocene records show consistently warmer than present-day Sea Surface Temperatures except for the past ~ 0.6 cal ka BP [Little Ice Age]. However, they do not exhibit an early Holocene temperature optimum as registered further north off Chile and in Antarctica. This may have resulted from a combination of factors including decreased inflow of warmer open marine waters due to lower sea-level stands, enhanced advection of colder and fresher inner fjord waters, and stronger westerly winds. During the mid-Holocene, pronounced short-term variations of up to 2.5°C and a cooling centered at ~ 5 cal ka BP, which coincides with the first Neoglacial glacier advance in the Southern Andes, are recorded. 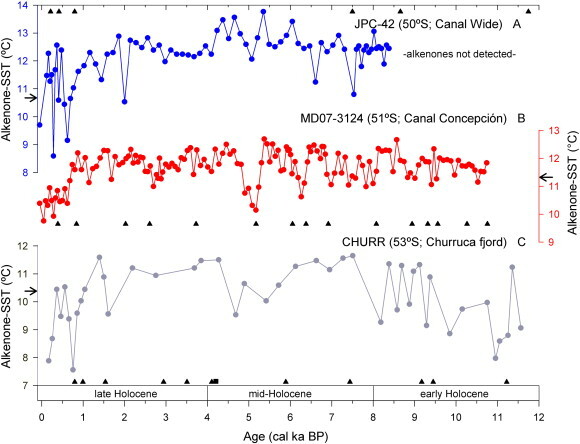 The latest Holocene is characterized by two pronounced cold events centered at ~ 0.6 and 0.25 cal ka BP, i.e., during the Little Ice Age. These cold events have lower amplitudes in the offshore records, suggesting an amplification of the SST signal in the inner fjords.